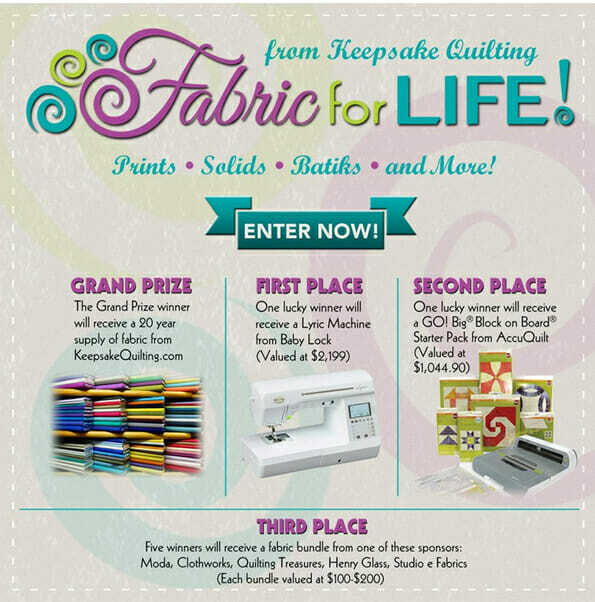 What if you won free fabric for the rest of your life? Something caught my eye in my social media news-feed a while back. 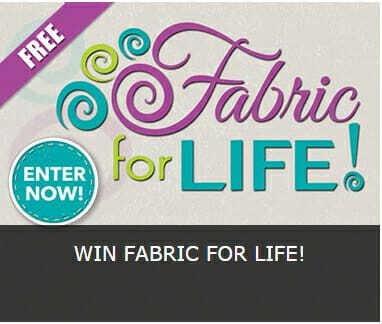 WIN FREE FABRIC FOR LIFE. What!!! Where? How? Really? I was all over that like ants on sugar. FIRST PRIZE – Lyric Sewing Machine from Baby Lock valued at $2,199. Yes please, that would be very nice too. SECOND PRIZE – GO! Big Block on Board Starter Pack from AccuQuilt valued at $1,044.90. I don't know anything about these machines but it looks cool. 5 x THIRD PRIZE – each winner will receive a fabric bundle from one of these five sponsors: Moda, Clothworks, Quilting Treasures, Henry Glass, Studio e Fabrics. So imagine for a minute. Every year for the next 20 years you can place an order for 52 yards of fabric of your choice. What would you order? What would you do with it? Gift it to friends? Sell it? Use it all, every single scrap? Take up a new hobby and maybe create awesome quilts of your dreams? Use the fabric to make things to sell or give to charity? Or just store it carefully and admire it every day – until you eventually had to move house because you had such a big fabric stash. Probably a combination of all of the above. Depending on how long you live and how fast you sew, winning 1,040 yards of fabric might just be fabric for an entire lifetime. Drawing is open until 31st December 2015. Sadly it's US residents only. Darn it. 46 Responses to What if you won free fabric for the rest of your life? I have a substantial stash…but free fabric for life? Is that what I saw? Well, once in my life I started a charity quilt group.Work took up bunches of time and house space (I was self-employed.) so I had to drop out and leave it to others. Now that I’m retired, I can do it again. It would be great to have the where-with-all to make multiple charity quilts on a regular basis. Not sure where I would start but it would be fun planning all the projects. Projects for family and friends. teach my daughters to sew. Donate projects to charity.